Latch is a tool for capturing the aura and majesty of the Appalachian Trail through the lens of those experiencing the trail and for those who long to be on it. 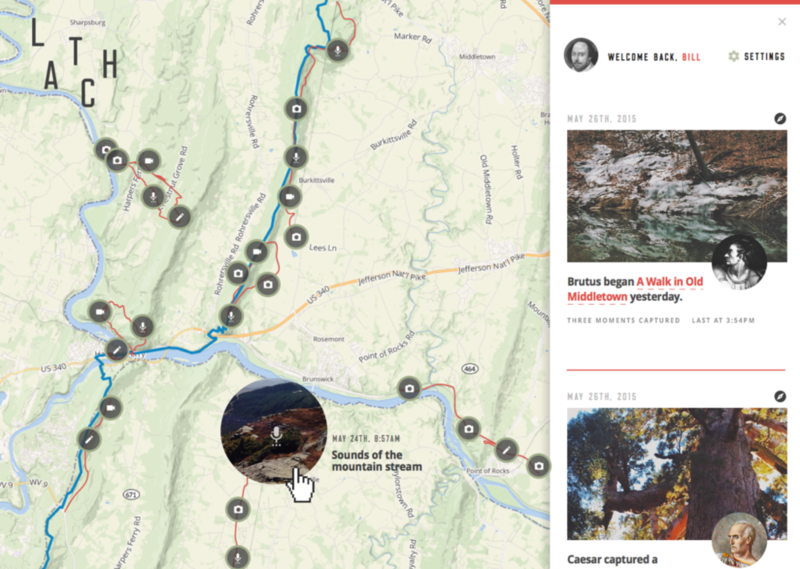 Latch allows users to live and relive their Appalachian Trail experiences through capturing, sharing and viewing a collective tapestry of trail moments. From the trail, users can share their Appalachian Trail experiences – the trials, the triumphs, the joys and the community – in a way that can sometimes only be told through an image, a sound, a drawing, a song, a video, a word or a sentence. Latch allows individuals to share these snapshots with others without interfering with the experience itself. The Latch app’s simple and minimal interface allows users to capture and share these moments while still being in them – whether on the trail, or looking back at the images, videos, sounds, and thoughts of a previous excursion, months or years later. Latch collects these moments in time and automatically populates an online tapestry and interactive map, giving a voice and window in on what’s happening on the Appalachian Trail. Additionally, Latch shares these moments through preselected social media channels —allowing individuals to share these moments but stay connected to the experience itself, not their digital tools. I led the brand and UX strategy for, and all designs are by Stuart Romanek. 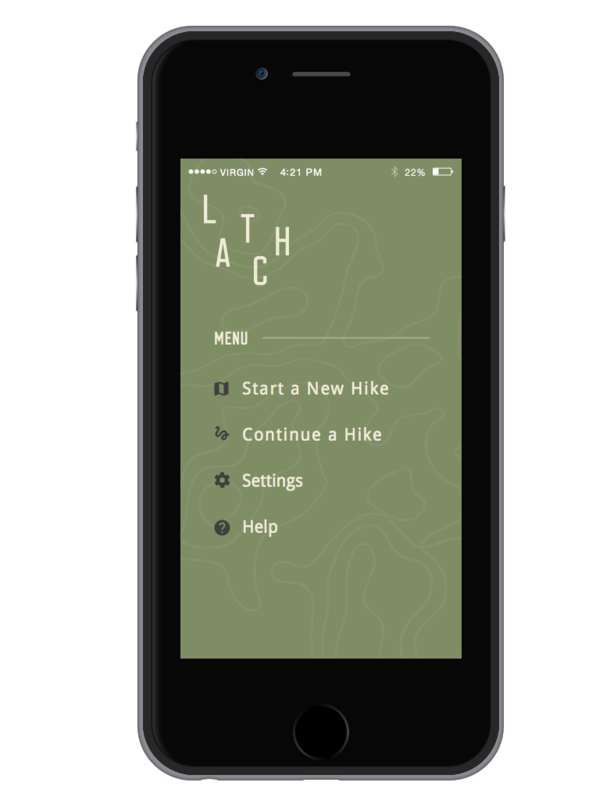 Working in partnership with the Appalachian Trail Conservancy, we kicked off this project with an open-mind and the goal of creating a digital experience that would support or enhance one's experience with or on the Appalachian Trail—not distract you from it. We set off with interviews with Appalachian Trail celebrities like Jennifer Pharr Davis, M.E. "Postcard" Hughes, and Laurie Potteiger (staff at the ATC and mentioned in the infamous book A Walk In The Woods) and later followed with an exploratory workshop in Harper's Ferry at the Appalachian Trail Conservancy headquarters with their team. Additionally, we collected ideas from hikers as they visited and passed through the visitors center. We needed to create a name and build a brand that resonated with our audience—particularly the existing Appalachian Trail community. Throughout our interviews, we were struck by the different pronunciations of Appalachian (one being "app-a-LATCH-an" and the other "app-a-lay-shun”) and the response to our own pronunciation of it. Through our partnership with the Appalachian Trail Conservancy, we learned this is a constant, playful yet tentious topic of conversation. As a playful nod, we phonetically extracted “latch” as it is a word that hold a lot of meaning and holds a story that will resonate with this audience. The Old English origins of the word "latch" goes back to the idea of ‘taking hold of, to grasp (physically or mentally)’—similar to how we hope Latch will allow users to capture experiences that "take hold" of them as they walk on the trail. From this, we created a mark that represents the playfulness of the word and the motion of moving along a path. The mark remains familiar yet timeless, and gives a nod to the visual language of outdoor gear (i.e. maps) while remaining accessible and appealing to a wider audience.